I spent a few days exploring Grand Staircase-Escalante in Utah back in May. 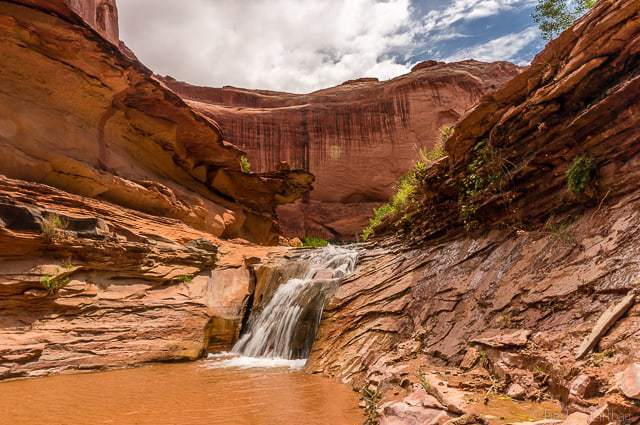 The highlight for me was backpacking Coyote Gulch just off of Hole-in-the-Rock Road… though it is technically in the Glen Canyon National Recreation Area, most begin the Coyote Gulch hike within Grand-Staircase Escalanate. This was a hike that came highly recommended by multiple people–I asked for recommendations on Twitter and Facebook–and the name just keep popping up, so I knew I had to do it. With so many rave reviews, I figured it was something I had to do. And I must say it was absolutely amazing. 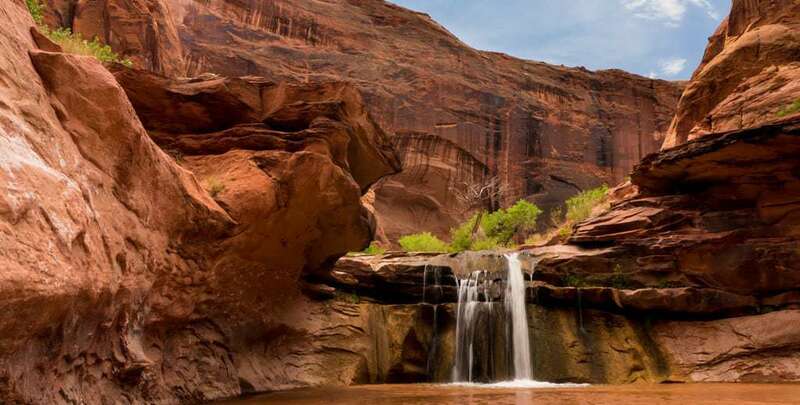 Three arches, a natural bridge, multiple little waterfalls, towering canyon walls, and a lush, serene oasis compared to the surrounding desolation. 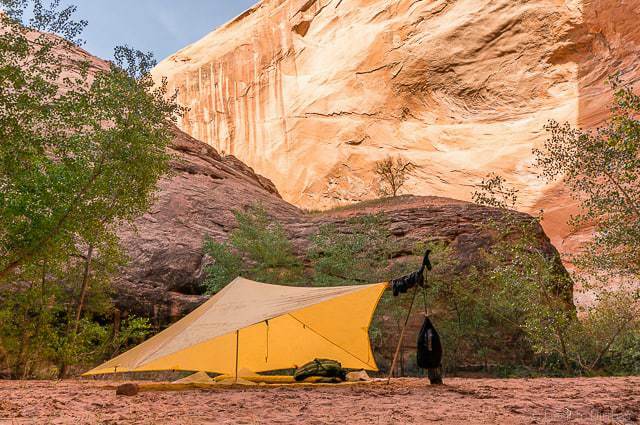 I made the trip a two night, three day, leisurely backpacking trip (out and back) down Coyote Gulch from the Redwell Trailhead to the Escalante River, which was 26 miles round trip. There are many different potential access points and different choices. I just kept it straightforward and easy by doing an out and back hike within the confines of the canyon itself, thus requiring no cross country navigation. Canyon country was new to me. 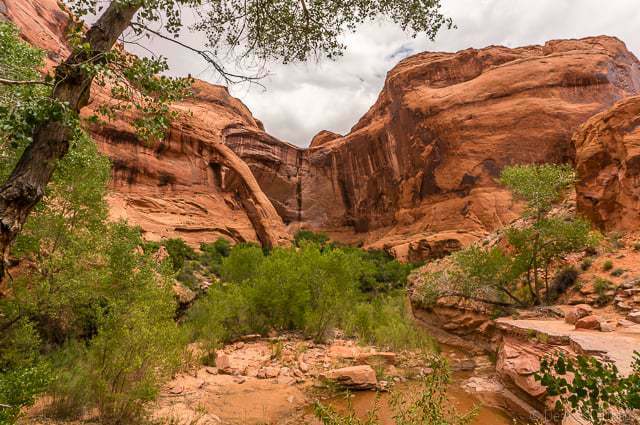 Starting from Redwell Trailhead, I hiked in approximately 7 miles to Jacob Hamblin Arch where I set up camp. This is a popular area to camp for sure, but there are many campsites along the bends of the river here. Starting from Redwell (versus Hurricane Wash) has some advantages in that you reach water faster, about 3 miles in, and it is supposedly much more scenic for the first half. 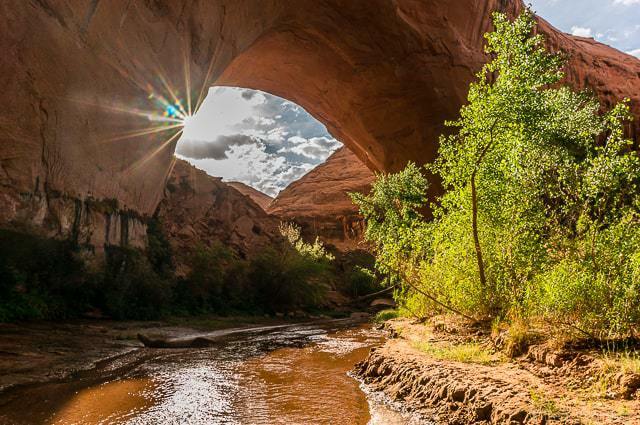 The next day I day hiked from Jacob Hamblin Arch to the confluence of the Escalante River which is approximately 12 miles round trip. This is the highlight of the trip, for sure, and I took my time marveling at every turn of the canyon, every waterfall, and the amazing natural features. The steep canyon walls only become more dramatic and overhung as you hike downstream. Maybe it’s just because the scenery was so different than what I am normally used to hiking in, but I loved it. 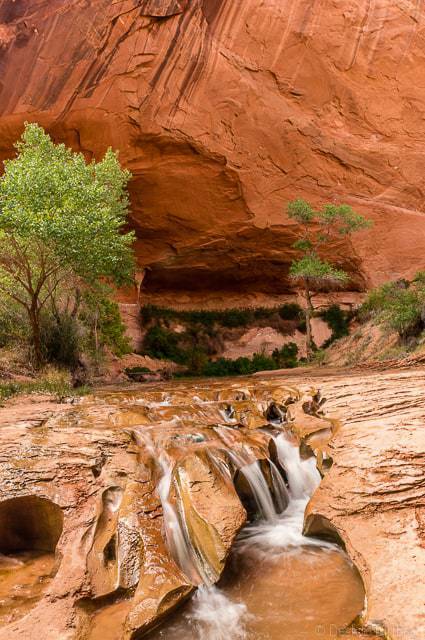 You’ve got the Coyote Natural Bridge just downstream, then you run into Cliff Arch high along the hillside, there are many waterfalls that you need to scramble around, and finally, at the end, you reach the Escalante River. Be sure to hike a little bit up stream to see the awe inspiring Stevens Arch located high above. All in all this was a really special and memorable trip. The 12-mile out and back to the river, doesn’t sound like a long distance. Normal that would take me 4 hours or so. But given the incredible terrain where I was constantly looking up and take photos, I think the hike took DOUBLE that. So plan accordingly. I almost got caught hiking back in the dark through the river. 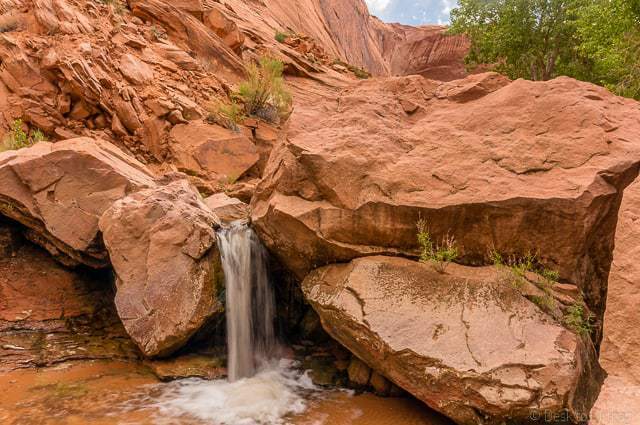 One of the must-dos in Grand Staircase Escalante. Funnily, I ran into a couple of other Seattle area backpackers on this trip, which I thought was unusual. 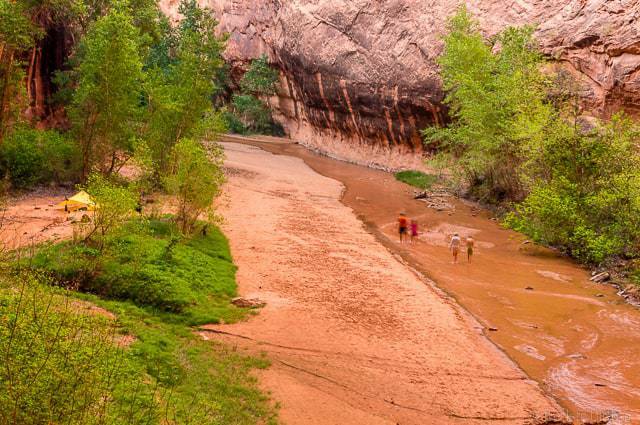 I also encountered a family out on an overnight trip–they hiked from Spooky Gulch down the entire length–their only warning was the lack of water from the beginning until almost reaching Hurricane Wash, a long distance if you are spending a night in between. This is a popular trail–they should really institute a mandatory blue bag policy here to reduce the impact of human waste throughout this narrow corridor. 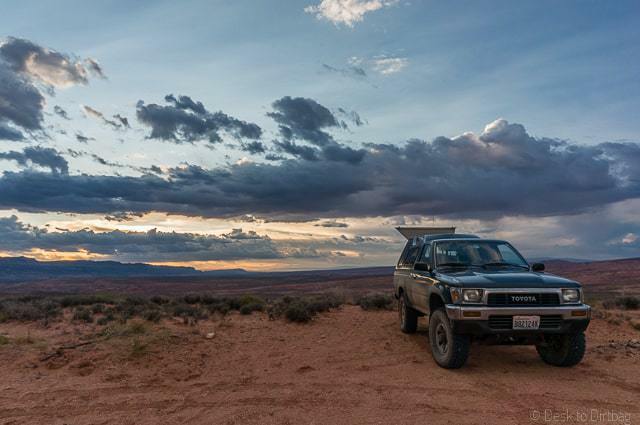 During the remainder of my time in Grand-Staircase Escalante I spent a number of nights just truck camping out along Hole-in-the-Rock Road, which was also cool. 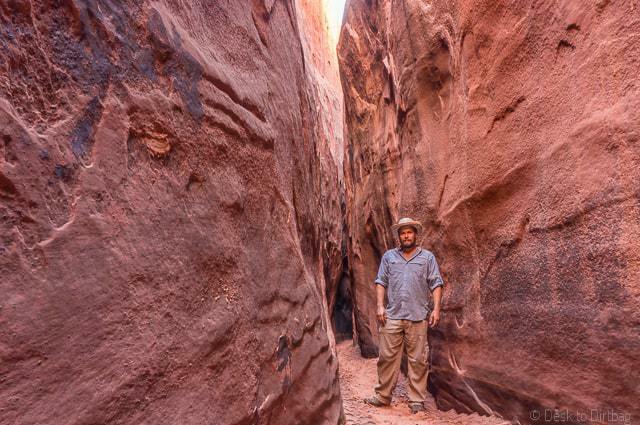 From there I spent some time exploring the area around Spooky Gulch, Peek-a-Boo Gulch, and Brimstone Gulch, among the narrow slot canyons, which I also highly recommend. Wikipedia has more details about alternative access points. 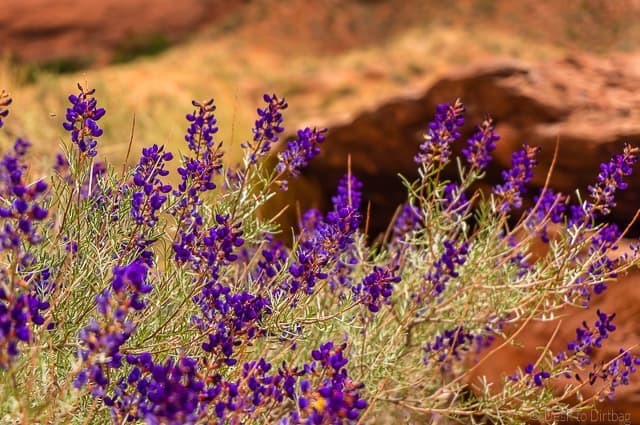 When you’re passing through the town of Escalante, be sure to check out Escalante Outfitters. The calzones rock, they have a great selection of microbrews, they’ve got WiFi, and any last minute gear or maps you might need. Oh and they’ve got free water spigots to top off your water jugs before heading out to the desert. 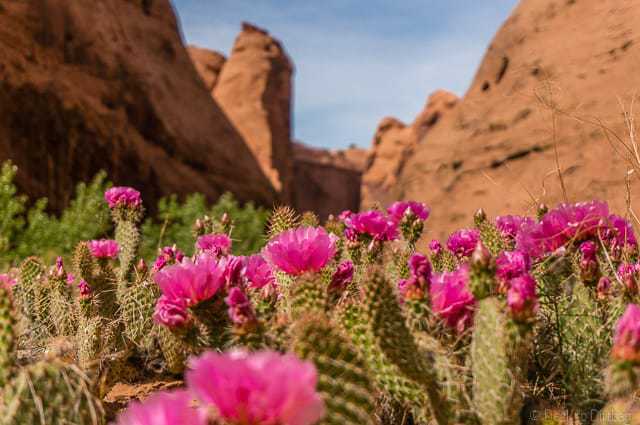 Enjoy this post about backpacking Coyote Gulch? Please don’t forget to LIKE IT or SHARE IT. I’ll be out there next week. I’m wondering if route finding is an issue along the Red Well trail? Great photos and thanks for the info! Thanks for the write up. I’ve read that some of the other hikes in GSE involve a lot of hiking/wading through water. 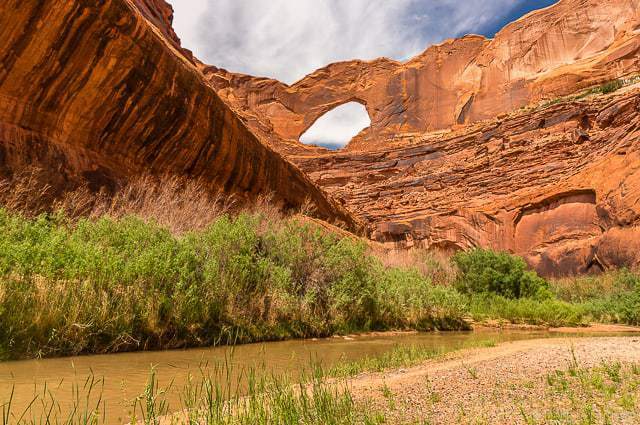 How about with Coyote Gulch? Thanks! Yeah, you’re basically hiking along a stream the majority of the time, it is impossible to not get your feet wet. Shouldn’t be any wading involved though. Got it, thanks! How deep is the stream? Like would it work to hike in waterproof boots or would they be fully submerged? Thanks again! Hi! Fires are not permitted in this area, correct? What did you bring to eat for three days? Thanks for any help! Hey Ryan, Really helpful article-thanks. How was the drive out to the trailhead? Could we make it in a sedan without issue? You should be able to make it at least pretty close, the last little section of road to the trailhead was heavily, heavily rutted, so many parked a ways back, just a short 10 minute walk. The road conditions may have changed by now, though I doubt they have improved significantly. Hello Ryan, great article, thank you for sharing. I’m trying to convenience a friend of mine to do this hike with me next weekend. My question is, about how much water did you take for the 2 night stay, 3 day hike round trip? Not much, just a liter or two, I filtered and treated water from the gulch for drinking or cooking. It’s a great hike! Awesome read and great photos. One question, what were the day/night temperatures like when you were there? It was relatively cool in the canyon during the day, maybe 70s, even though it was scorching just above. At night it wasn’t particularly cold either, maybe upper 40s? Hey Ryan! Looking forward to hitting this area in a couple of weeks! 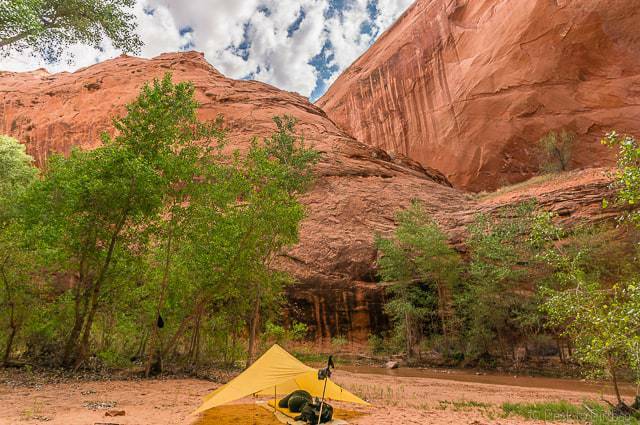 When you did the day trip to the river confluence, did you just leave your camp set up back at Jacob Hamblin Arch? Yep, just left my camp where it was… I had not worries or issues in doing so. Just brought along a small daypack. Enjoy the trail! 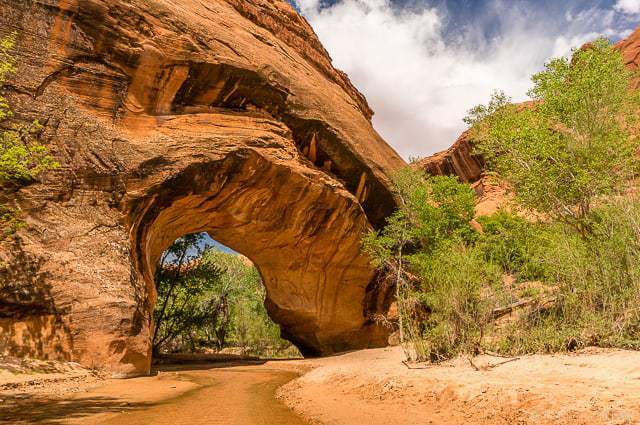 How long do you think it takes to hike from Hurricane Wash to Jacob Hamlin Arch? We will be setting up camp and there I know everyone hikes at different paces, but just a round about time frame? Have you actually done that route as well? That’s the way we will be hiking in this week and I cannot wait! I did it back in ’07 but I can’t remember that far back on the time frame from there to JH Arch. I’ll have my dad and brother and sis with me and I would like to be able to plan for our hike back out on what time we should start hiking out to get back to Salt Lake at a decent hour on Sunday night. I hiked in from Redwell, not Hurricane. In total that is about 7 miles to J Hamblin arch, so let’s say 2-3 hours depending on pace of 2-3mph. I don’t recall the distance from Hurricane, just heard that you reach water faster and it’s generally more scenic hiking from Redwell. Let us know how it was though! Awesome! Enjoy the trip and be sure to check back in and update us on conditions / your experience! How cold was the night in the canyon in May? Just wanted to drop a line and say that my friend and I did this hike in a day through Hurricane Wash and in to Coyote Gulch – we made it a bit farther past J. Hamlin arch and are so glad we did – it was truly a fairly land in there, one that I want to go back to with my camping stuff – our only problem was forcing ourselves to go back. A very long hike but not difficult – we were, however, very tired stomping through those last three miles in Hurricane Wash with the deep sand going back to the car. We were happy, though – as you are stomping through that deep sand in there, you notice all the dinosaur bone fossils, geodes and baby geodes, rocks with imprints of sea shells and all kinds of super neat stuff. So it was all just sort of a magical day, topped off by a hullo from some friendly cowboys driving their cattle up Hole in the Rock Road and a very fun dinner at Escalante Outfitters (the calzones definitely do ROCK!) with some dudes on motorcycles enjoying a 50th birthday from Germany who livened the place up. Great, great place for sure. So the hike is definitely doable through Hurricane Wash in a day – But I gotta get back there with my back pack and stay a while. I’ve been trying to make sure I was prepared and reading a lot of accounts about hiking Coyote and many of them said they wouldn’t do this in one day, you should camp in there, etc, and that the first bit from Hurricane Wash was terrible (as in hot and long) and etc. I’m too psyched to listen though and I’m glad to hear your account. I can’t wait! I’ll so be in my happy place there! I think it’s better to do it as a multiday just so you don’t feel time crunched. But if you can do a 14 mile round trip, you can do an out and back to J Hamblin Arch. Maybe consider starting at Redwell, instead of Hurricane Wash. That’s what I did. As far as my knowledge goes, you reach water faster and it is a supposedly more scenic start. Don’t get yourself Aron Ralston’d. Maybe set a turn around time between you and your friend so you are on the same page about when you need to start hiking back to arrive before dark. Great web site, by the way. 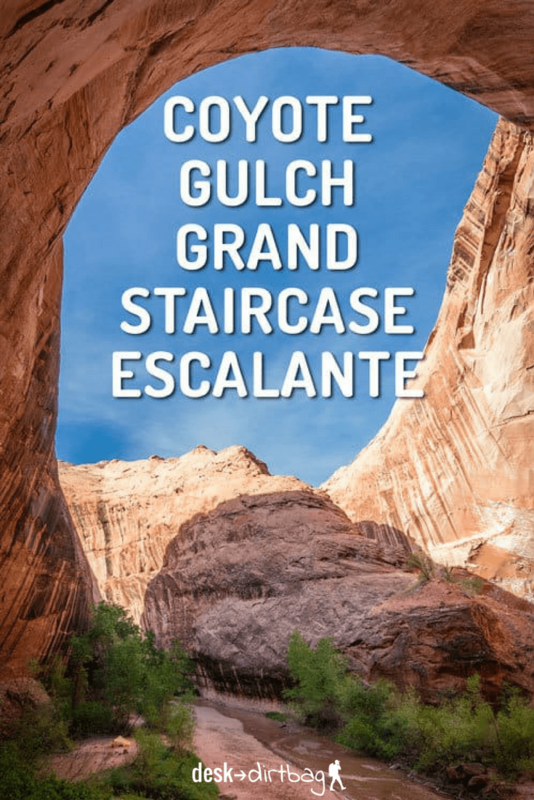 I’m heading to Escalante next week and really want to get in to Coyote Gulch, but kinda don’t have the time to camp there. Don’t mind walking long distances (I”m from Colorado and most of the hikes you do there are at altitude and you cover a lot of vertical distance) and I am bringing a friend with me and she’s never done stuff like this before (but she’s in very good shape – I’m certainly in pretty good shape, as well). What would you recommend for a day hike? Taking in mind I’m just starting to rock climb and she never has done anything like that, either. Hey Christine, thanks for the comment. I didn’t do tons in GSE, but I really think Coyote Gulch was the most amazing of the bit I did. 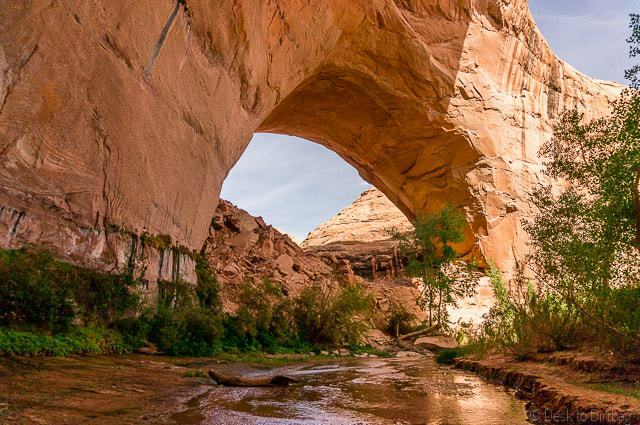 I’m sure you could make a dayhike out of hiking out and back to J Hamblin Arch or maybe even to the Natural Bridge depending on what you feel like doing. There’s nothing extreme about hiking up to that point. A little further down there is some slightly more scramble-y stuff as you get to the waterfalls. So yeah, I’d recommend that. Or exploring the slot canyons just north of there, as mentioned in the write up, which I just dayhiked as well. Those two areas come the most highly recommended to me, which is why I checked them out! Navigation wise, Coyote is simpler, you’re just hiking in a canyon. It’s also more scenic and pretty, in my opinion. 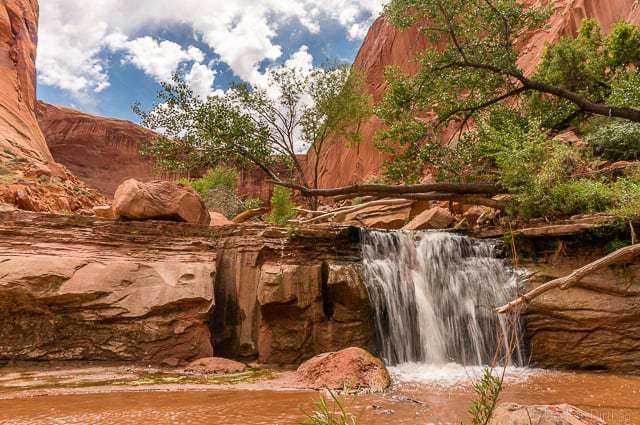 You get to walk along and watch as a dry creek bed turns into a trickle, then a stream, a river, and eventually waterfalls, arches, and cool canyon walls. Enjoy! I am doing this exact hike in March, I have a friend who is afraid of heights. 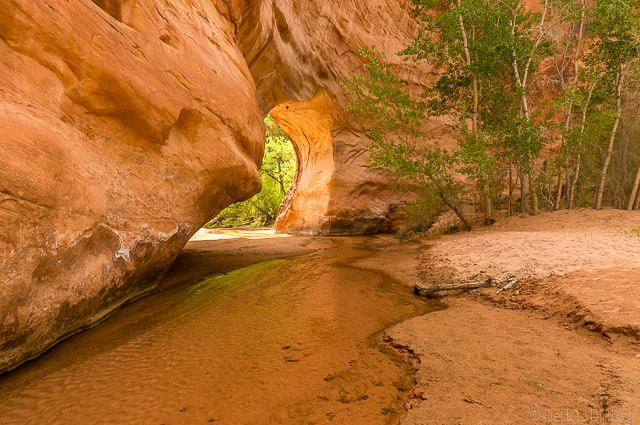 When taking the Redwell trailhead to the Escalante River and back, do you have to scramble up the Jacob Hamblin Arch area? Or is that just if you are exiting out that way. Hey Sherri! There is not any exposure to heights around J Hamblin Arch if you’re hiking along the river, that would just be if you were scrambling up the slab near to get back up top for the overland trek (which I heard can be intimidating–it is low angle, but kind of exposed). But if you are doing the out and back, you don’t deal with that. 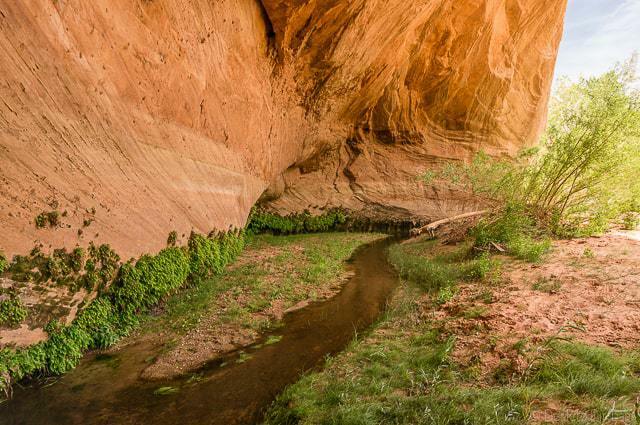 There is however some exposure and cliffs that you run into as you near the Escalante River. Not sure how skittish your friend is, but that might be a little unnerving for them. Otherwise the entire area before that from Redwell on down to many of the waterfalls is not exposed–not that I can recall. Enjoy it, it’s an amazing trip!